MORE than 30 beaches and pools in Mallorca took part in an event to raise awareness about multiple sclerosis. 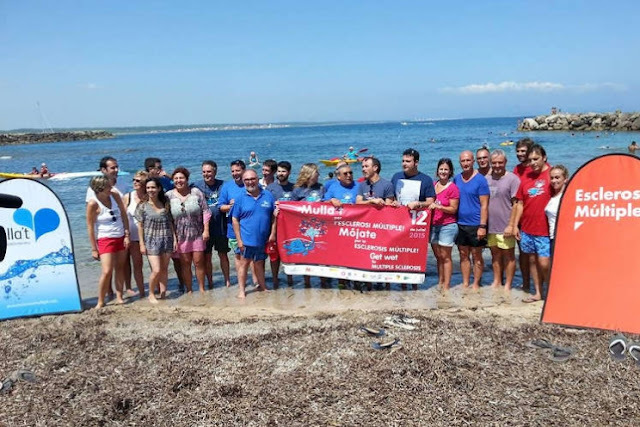 The Mulla’t (Get Wet) 2015 campaign was organized by the Balearic Association for Multiple Sclerosis (ABDEM) for the 20th time this year and was set up at the Colonia de Sant Pere Beach in Arta where it was the first time, back in 1995. The sponsored swim was attended by the President of the Association, Andreu Anglada, and the local representative, Mateu Llodra, amongst others members of ABDEM. The Vice-President of the Balearic Government, Biel Barcelo, took part, as did many other members of the Balearic Islands and Mallorca’s political scene. ABDEM aimed to raise awareness of their need for larger facilities to take care of people affected by the disease. Across Mallorca, many people visited the pools and beaches to swim their sponsored lengths or take part by purchasing beach gear sold by ABDEM and making donations. In Alcudia alone, more than 95 people had swum before 1pm. All those who took part across Mallorca received a diploma to prove that they had attended.